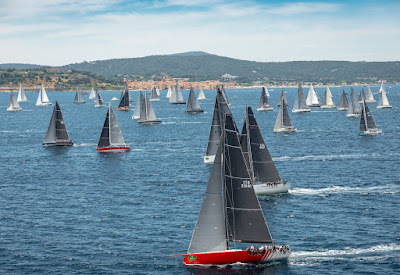 After the triumphant Rolex crew party on the beach of Ponche, today at 12:50 the starting procedure began for the long race in the 66th Rolex Giraglia. Regular starts for the big fleet which was divided into four separate starting groups, with the smallest (Groups B IRC/ORC) leading the way, followed a 10 minute intervals by Group A, Group 0 and then the IMOCA 60. It brought on the usual thrill to see such a heterogeneous fleet leave their moorings in Saint Tropez and head out of port for the long race: 241 miles with uncertain weather, with slim chances of beating the record of 14h56m16s set by Igor Simcic’s maxi Esimit Europa 2 back in 2012. Anyway, the expectation on board the faster boats was for a race lasting 24 to 30 hours with good wind pressure on the way out but less on the way back. But the weather picture was far from certain, and anything can happen. After the start gun, the big yachts quickly pulled away towards the offset mark at Formigue and then headed south-east for the long sail towards Corsica. “We haven’t yet decided how many of us will be on board” - said Michele Ivaldi, strategist and helmsman on board Momo, the German Maxi 72 that won the 2017 edition, the day before the start - “last year there were 12 of us – the standard crew is 22 – but very light wind was forecast. This year we’ll probably be somewhere in between”. Nothing is left to chance and the analysis of the race is increasingly fundamental for making strategic decisions, especially for the very fast Maxi 72s where the speed difference over rivals also depends on tiny variations in the weight carried on board. For the first time, saluting the Rolex Giraglia fleet was the 60 m brigantine Nave Italia which, flying the burgee of the Yacht Club Italiano and of the Marina Militare, is engaged on its summer cruise and promotes navigation as a training and therapeutic tool for disabled and disadvantaged people. On board Nave Italia on the special occasion was also councillor Ilaria Cavo, who came to underline the importance of these projects and show the commitment and closeness of the Liguria Region to the Club’s sporting and social activities.